Where is the damage and how extensive is it??? Only in the front with the rest of the car behind the firewall completely intact. The engine is also intact, and so is the frame, per their preliminary assessment. The bumper, hood, both fender all got damaged (at the top of the fender from the hood flopping open and pushing again the rear top edge). The radiator and fan got pushed into a plastic structure in the front of the engine. There is also flay on the belt in front of the engine. I will be sure to check the work carefully at the completion. Per comments I have found, this shop seems to do good work. The shop is called Collision Revision. They have many shops around the Chicago area, two in Indiana, and one at Ft. Myers, FL. Many of their branches are MB Certified Collision Centers. Thanks to peter210 Im off to my local dealership in the morning armed with the Tech bulletin on saggy rear ends. My car is dropping 52mm (close to 2 inches) overnight. I hope this all goes well with the dealer as they have been very obliging to date with regard to a couple of non related issues. Last edited by barlow100; 06-16-2013 at 07:46 PM. My car is dropping 48mm (close to 2 inches) overnight. I hope that it doesnt turn into a dustup over the warranty claim. 2 inches!--That's a big drop. Peter210 will be able to e-mail you a copy of the bulletin. I don't know how to post it on the forum. Maybe Peter can e-mail it to one of you who can then post it up. I have a copy courtesy of peter210. The dealership has been very agreeable and has logged the fault for parts replacement before I have taken car to shop. One of the main reasons I bought extended warranty for my 2010 pre-owned. Good luck guys! Thanks for the info. Good news. Dealership has followed the Tech Bulletin to the letter, tested the compressor and the rest of the system as outlined. The rear bellows will both be replaced under warranty with the compressor and the rest of the system logged as possible items of Consequential Damage for the future should there be any problems. Couldn't have asked for better service. I just had my 12 E63 wagon in for A service along with a few things to check out. One item i had an issue with was a whooshing sound from the front struts, along with the rear dropping in colder weather. They did a reflash update to the suspension settings. So far the noise is gone. Not sure about the loss of air. Will find out this winter. I would visit your dealer and have the dropping rear logged as a possible fault. I left the car with them for a few days as they have a measuring regime which they have to follow prior to replacing rear air bellows. Can I get a copy of the service bulletin also? I'm hearing a whoosh sound and seeing my suspension drop in the rear shortly after parking the vehicle. Is this normal? I don't remember the name of the person who has the service bulletin. Search for it or scroll down on this forum and I'm sure you will find the thread easily. It's very helpful to bring it to the service dept. Mine started going down over 38mm overnight, more on the NSR than OSR. Having done my measurements to prove the drop and copied the dealer the technical bulletin, they examined, completely stripped the sytem, but found no water from the compressor, and replaced the air bellows which they found to be leaking. I did not have any resistence from them or delay from MB UK, had a courtesy car throughout and all was done on warranty; so all credit to Mercedes-Benz of Dorchester. Find More Posts by P.J.S. Once the bellows are replaced, is the problem solved for the long term? My 2012 had a 2/2012 in-service date, but was probably made in December. Its fine to get fixed if it happens, but I would like to think it would stay fixed. Funny enough, I once had to replace the bellows in a 1976 Mercedes 450SEL 6.9 I owned. They cant make them work after 37 years? Had this issue as well and they replaced pneumatic springs and valve unit. My only concern now is that the back of the car seems to sit so high. Does anyone know if it will drop back down or if its going to be like this? Does this seem normal to anyone? Dude! It looks like they have turned your car into one of a kind crossover. You sure you haven't gone to a MB dealer owned by the Ghetto Motor Group. Man, it looks like they are prepping your car to fit some 30+" rims the next time you are there. It can probably wear a "EL63" badge for now. Joking aside, that wheel arch gap is way, way too big. I have never seen the gap being that big during the more than 2 years I have owned my car. I have just gone outside to double check on mine as well. BTW, are those replica wheels? I specifically have the 18" on mine and the appearance on yours strike me as obviously different. Last edited by otakki; 01-15-2014 at 10:07 PM. 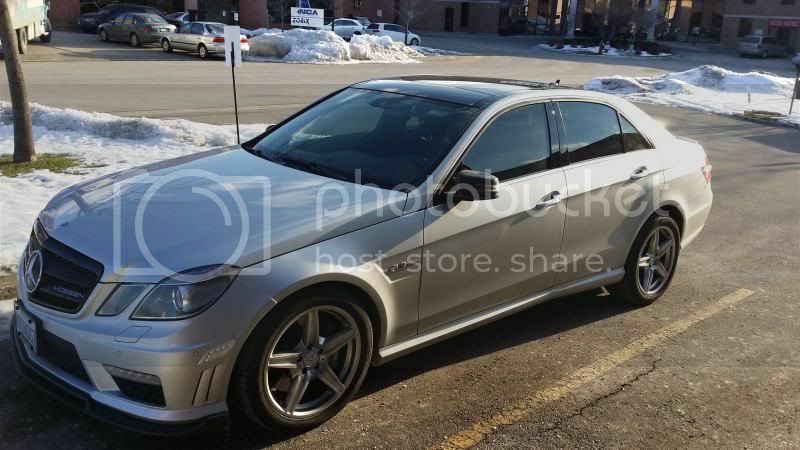 '14 E63S, '13 G550, '06 E320 cdi, and a bunch of other stuff. Optical illusion or are those rear wheels smaller than the fronts? So, on my 2014 wagon, I noticed that after I lock my car, I hear a "Psshhhh" and the back of the car lowers. That isn't what you guys are talking about right? I am guessing the 2013 and older cars just retain the height and leak out over night? My 2013 E63 does the same thing... Hopefully its not a problem? Can anyone confirm this? 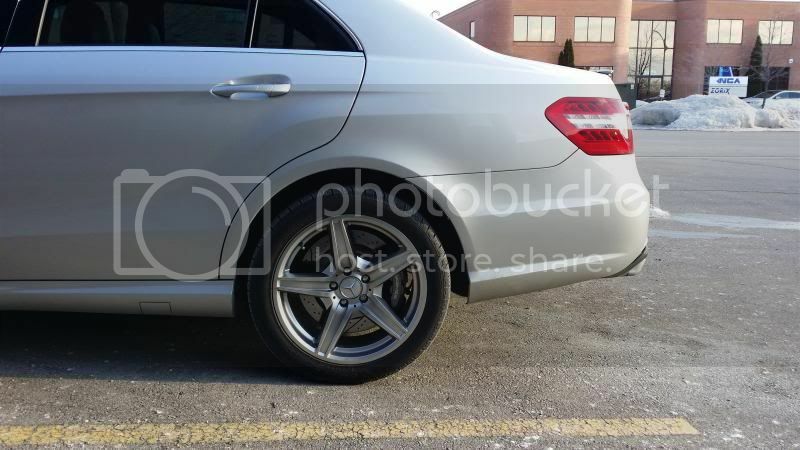 I have an 2010 E63 and I can hear air coming out sometimes after I exit the car. I think I can remember it even when I walked up to the car but that was a rare occasion.